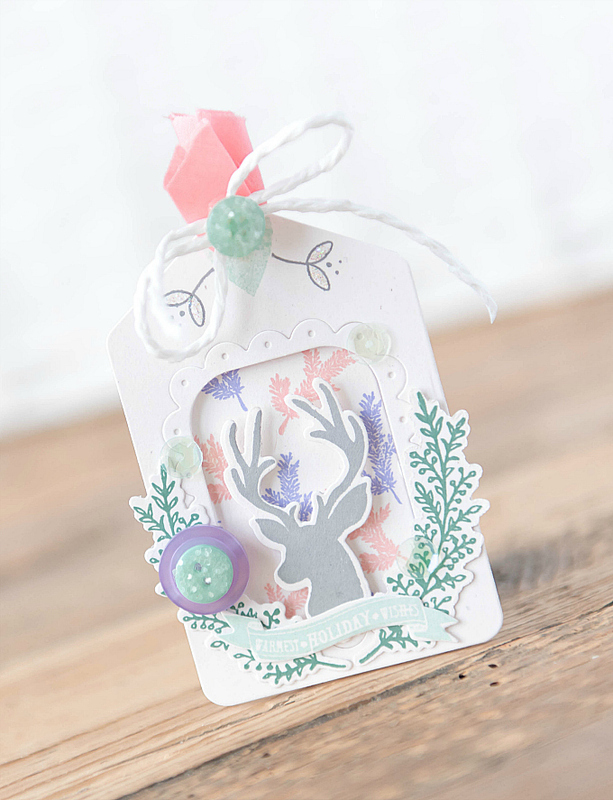 Christmas Wishes - How to use Printable Tags - On Sale Now! 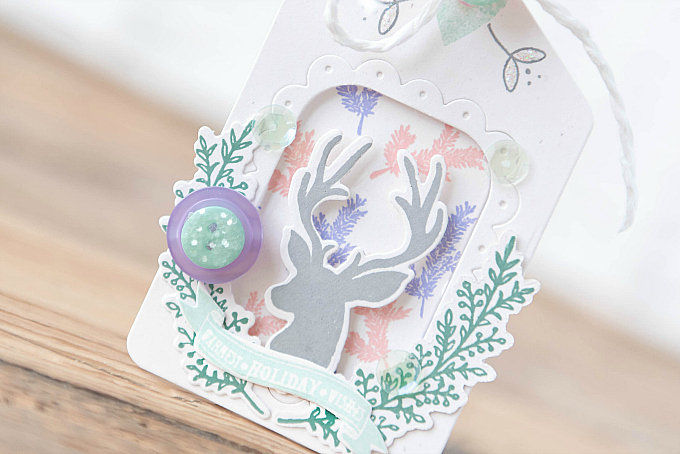 I've been whipping up some more traditional cards lately with soft, vintage, Christmas tones. Since I'm still deciding what shades to work with for our decorations at home, it's been sort of fun playing around with different options on paper first. Our year-round decor is rather neutral, which means that Christmas time is always fair game for all sorts of colorful combinations. 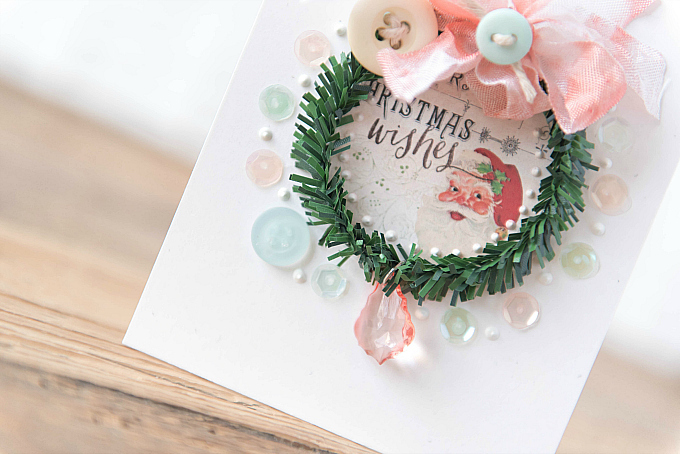 Keeping in theme with decorations, I wanted to create a pretty wreath for this card. Wreaths are my all-time favorite Christmas (and year-round) decoration. I also love beautiful, fresh greenery - whether it be boxwood, cedar, olive, pine, eucalyptus or anything in between - so this tinsel was just the perfect touch for this card. It's actually such a fun product and looks great as is, but can also be decorated in so many ways. Think of it spray painted to create different colors, or with a dash of glitter or white paste to mimic the look of snow...Or how about adorned with cute little felt "ornaments"?? I will have to give those techniques a try...But for this card, I opted to keep it au natural. I think it really helps the other elements on the card shine! Iralamija on Etsy. If you love vintage bits as much as I do, you'll love all the goodies Beatriz has in her shoppe. 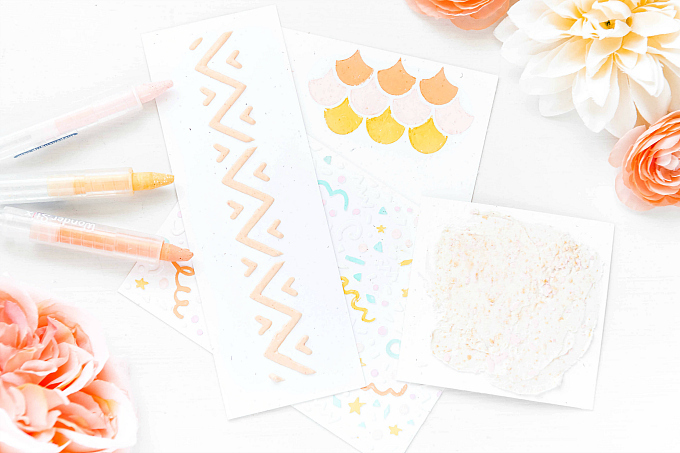 The best part is that once you place your order, there is no shipping, no waiting, and no bulky paper or product sitting around in your crafty space! Can I get a high five! Once you purchase the digital files, they're instantly ready for you, whenever you need them. You simply print them on your favorite cardstock and you're all set. Annnnd......It's a perfect chance to stock up right now, because her gorgeous shoppe has an ongoing SALE up to 60%! Oh and don't forget to check out Beatriz' beautiful blog, too! It's full of pretty projects and so much wonderful inspiration. After adding the tag to the center of the card, I simply molded the tinsel wire until it just covered the edges of the tag, and used some heavy glue to adhere it - for me, a glue gun works best to keep things in place. For the topper, I added a vintage pink bow, with a little Aqua Mist button, and a wooden button to the side. On the top, I added some polka dot washi tape to bring in some more of the aqua tones. I felt the card was a bit empty, so I added alternating sequins and liquid pearls around the wreath, also adding liquid pearls to the inside of the wreath. I finished things off with a large off-center button and a sparkly dangling crystal. I used a combination of Papertrey Ink dies and some very sweet Christmas stamps and dies that I picked up at Michaels some time ago. They're no longer available in-store, but I found the set here. After die-cutting and stamping all the little bits, I used Tag Sale #10 to create the tag base and the adorable peek-a-boo window. For the ink colors, I used Ranger's Archival Ink in Tea Rose, Violet, Library Green and Watering Can. I love the bits of sparkly glitter here and there, and a few tiny sequins poking through. I enjoy decorating paper just as much as I enjoy decorating our home for the holidays. I can't wait to try one of these palettes in our home this Holiday Season. 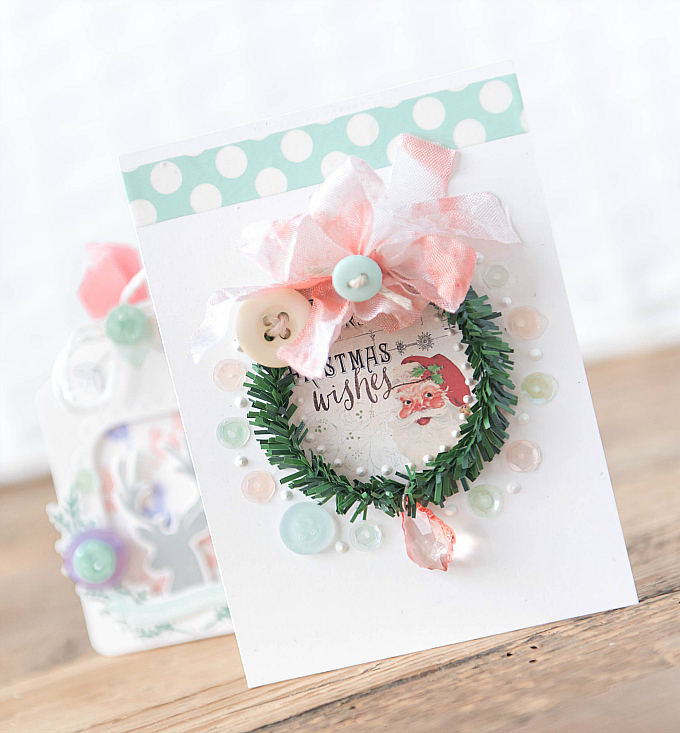 Both of these are available in the shoppe today - but I'm also making up a couple of kits with supplies so that you can make your own little tags and Christmas cards. If you're interested, please let me know and I'll prepare one for you. I will also be posting the kits here soon! Thanks so much for joining me today friends, I'll be back soon with more to share! That card you created is just gorgeous!! 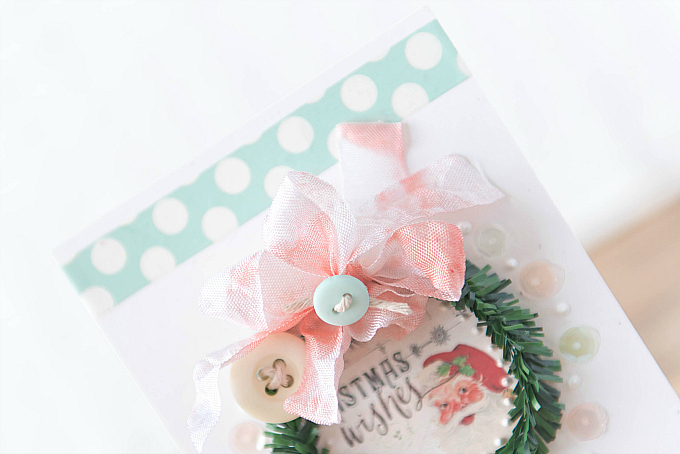 I adore the crystal clear colored buttons around the wreath and that pretty bow. I love your tag with that deer too. BEAUTIFUL design! These are beautiful! 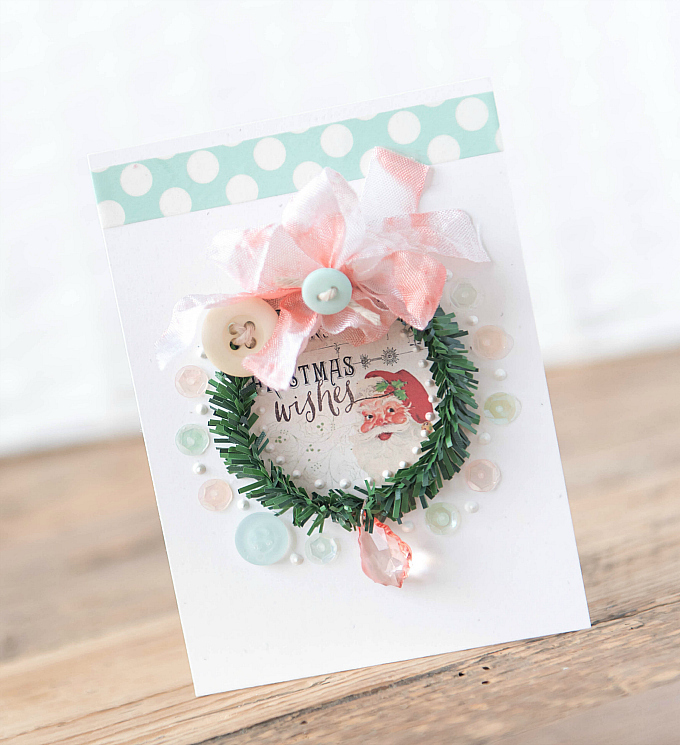 I love that sweet little wreath and the bling you added to the card. The tag is an especially lovely design! I agree with holding off on the Christmas decorations. I like to give Thanksgiving it's moment in the spotlight! !